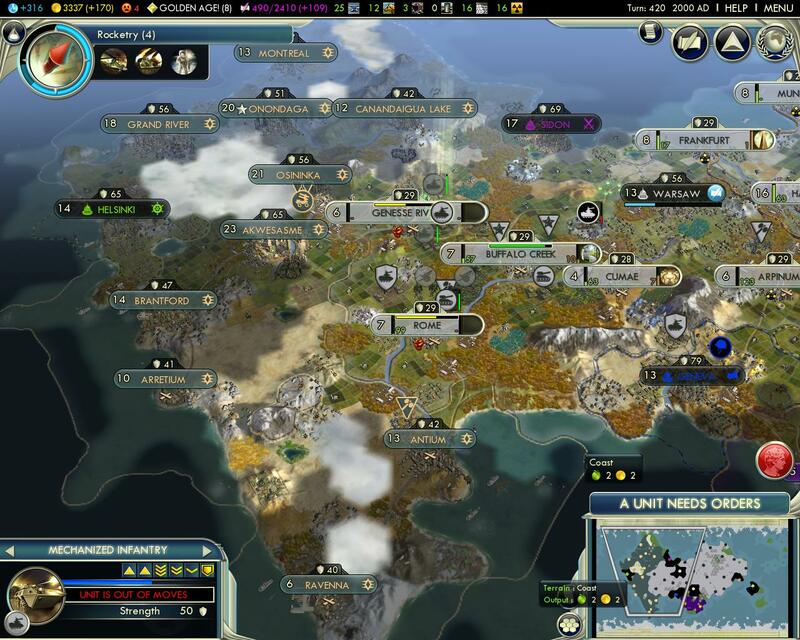 I had not played a Civilization game since the original way back when, and needless to say, I was totally engrossed. So how does one "beat" a game like Civilization, which is somewhat akin to saying one has beaten chess. 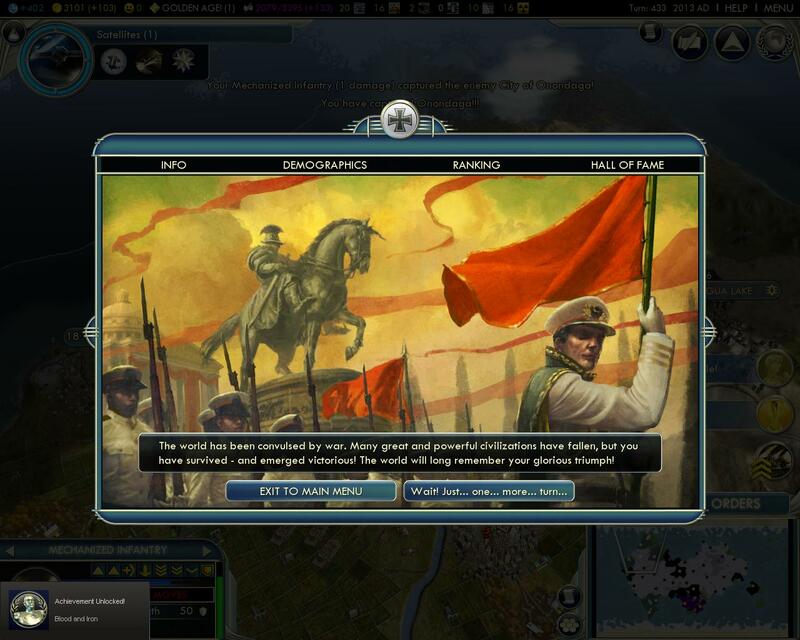 Well, I won the game with every single civilization, on every size and type of map, and at the hardest difficulty I could handle (though not all permutations of the above). 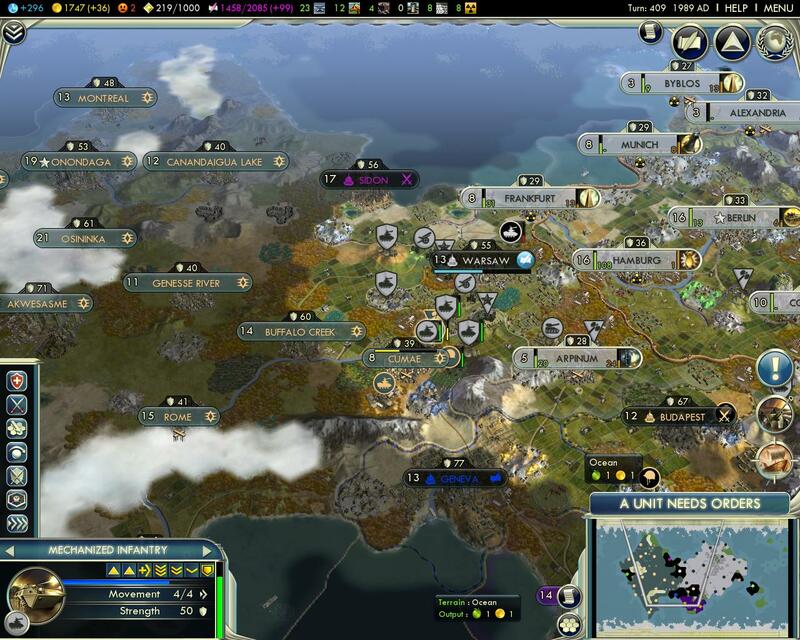 Below are some memorable highlights from some of my Civilization games. Siam is a fantastic civilization to play if you are a wonder freak, and perfect if you want to try for a one-city cultural victory. 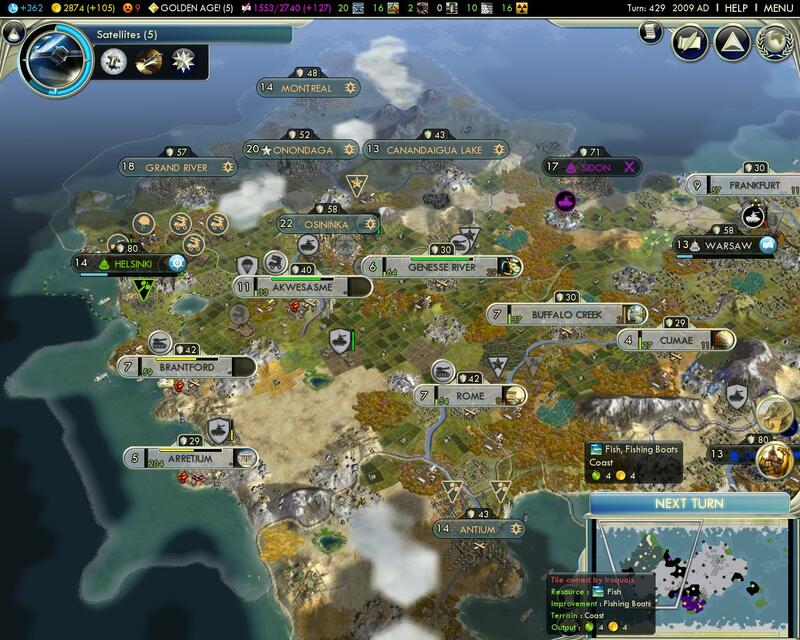 A cultural victory consists of maxing out five policy tracks, and then building the Utopia Project wonder. Siam's passive benefit "Father Governs Children" greatly increases the amount of food or income that comes in from city-states, allowing a single capital to flourish. Further, the advantage of the one-city approach is that it requires less culture to reach each policy. I started out with Siam on a little peninsula next to the Americans. In no time I had turned it into a fortress, complete with the Great Wall. 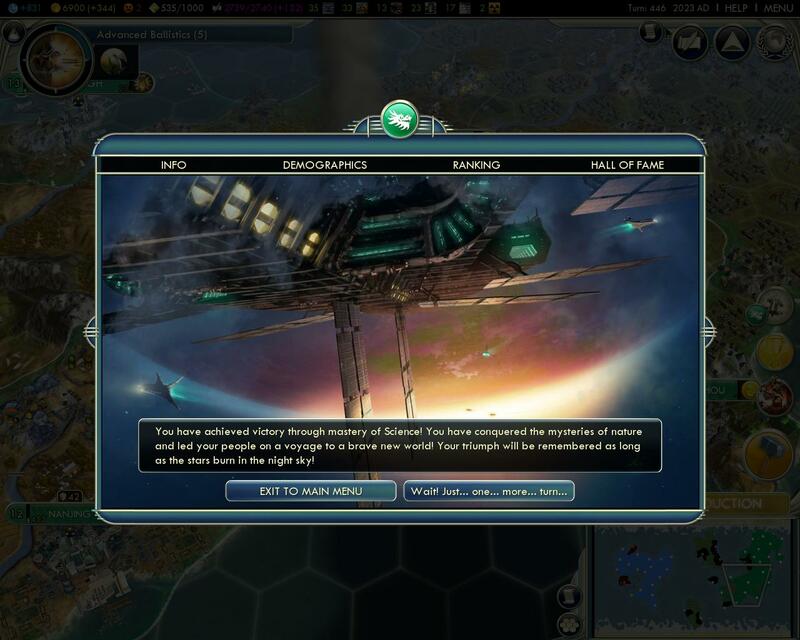 I had to keep pace militarily so that other civilizations would not consider me an easy target. 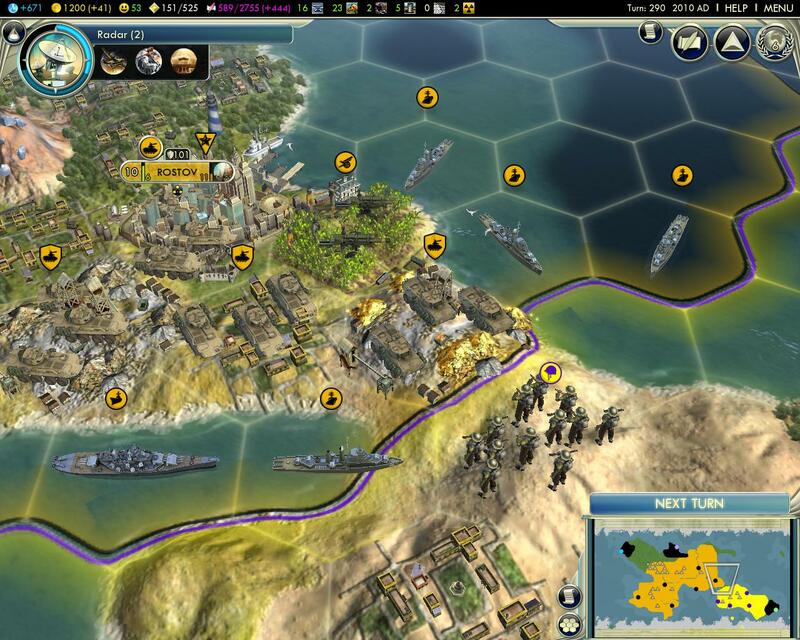 A few land units near my border with a great general nearby, supported by some ships, were enough to keep the peace. 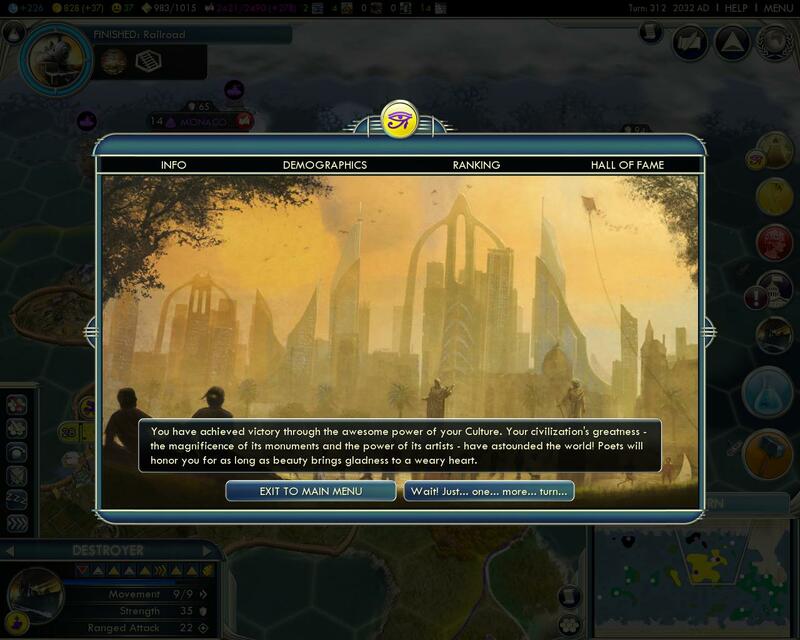 With that, it was mainly a matter of building wonders for their cultural bonuses, and improving my gold income so I could continue to maintain allied status with cultural city-states to reap the extra culture in my quest for utopia. China is a powerhouse of a civilization, and their "Art of War" passive benefit allows great generals to spawn more often from combat. 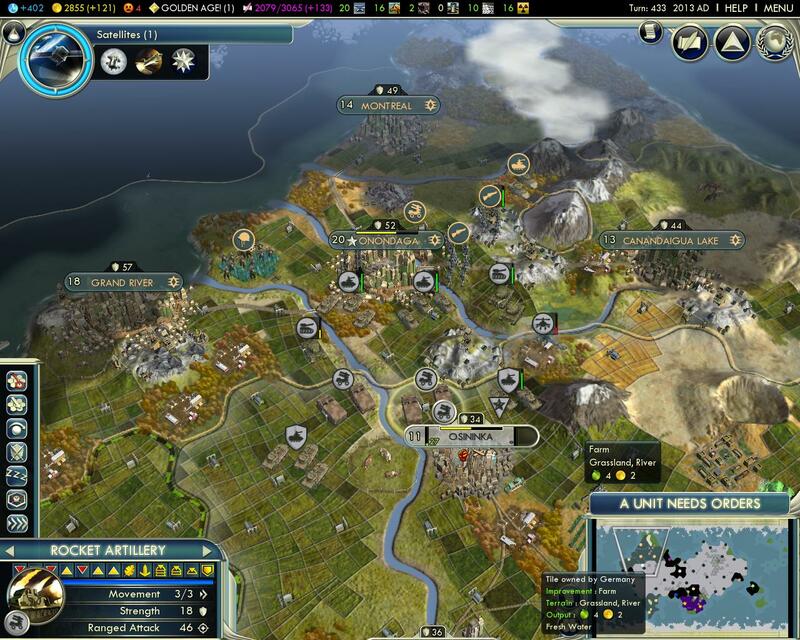 This helped me annihilate the other nations on my continent while an opposing civilization did the same on his. 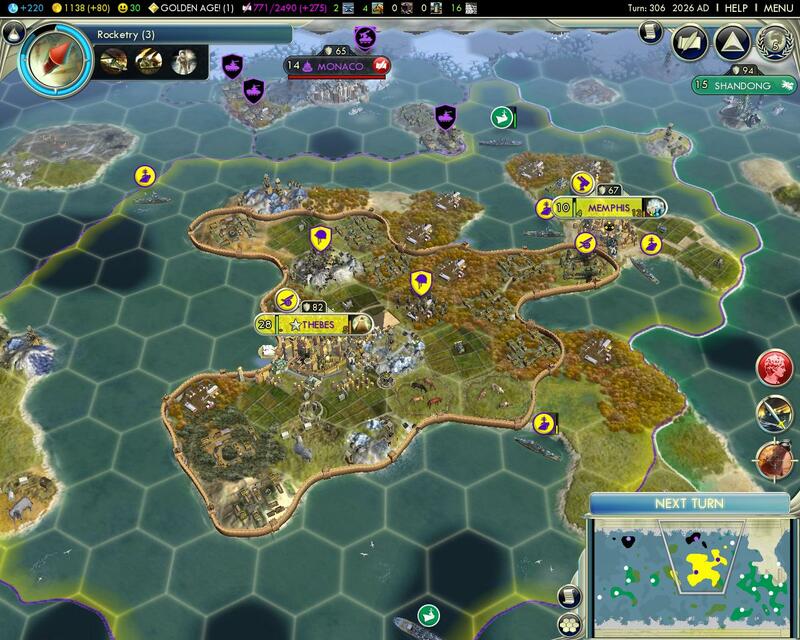 Illustrating the flexibility of China in Civilization V, rather than waste resources attempting to amass an army and navy large enough to handle an amphibious invasion, I changed my strategy to concentrate almost solely on science and production. This allowed me to have several production powerhouse cities ready to build spaceship parts when the necessary technologies were researched. I do not know how close the space race was, but after shipping all the spaceship parts to my capital and assembling the ship, I launched for Alpha Centauri first. Germany has a great special ability, "Furor Teutonicus" that allows you to convert barbarians to your cause. I ended up with an early game horde of barbarians that allowed me to bloody Rome's nose and wipe Egypt off the map as I continued to upgrade them through the eras. With Rome out of the picture, I set out for the Iroquois capital. I had to take a few cities along the way. After reaching their capital and surrounding it with tanks, infantry, rocket artillery, and few helicopters, it was not long before the game was won. Russia is a well-rounded Civilization that tends to expand quickly partially due to its "Siberian Riches" benefit, which increases the amount of production and strategic resources gained. It is also great fun to churn out massive numbers of Cossacks to dominate open terrain. The only thing notable about this duel map with Egypt was that after establishing my capital area in the southwest, I had the good fortune to setup an outpost city in the southeast corner of the main landmass only to discover that I had completely penned-in the AI. The AI became increasingly frustrated and eventually declared war. I was stretched thin when a city-state in my midst that was allied with him also declared war. After putting down the city-state, the border settled down into a 38th parallel-style standoff. Go ahead, make my day. Egypt is another civilization that is good for pushing for a cultural victory, mainly due to its passive ability "Monument Builders" which adds a production bonus when building wonders. This duel game on an archipelago map was completed at the second highest difficulty. I was under constant siege by the AI as I continued to amass culture, balancing production between military units and some wonders. My second city was pounded by bombers, necessitating air defenses. I prevented him from making landfall, but by the time I reached utopia, I think my time was limited.